Trelawney Cottages are situated 900 meters from the beach. Leisure Bay offers a tranquil haven of unspoilt beauty with sparkling swimming beaches, sub tropical dune forests, sheltered bays and rocky promontories. The 3 luxury self catering (2 x 8 sleeper & 1 x 6 sleeper) cottages are fully equipped and serviced daily. Each unit has a TV, but please bring your own satellite decoder and 'Smart Card'. Bath Towels are provided. Laundry services can be arranged. 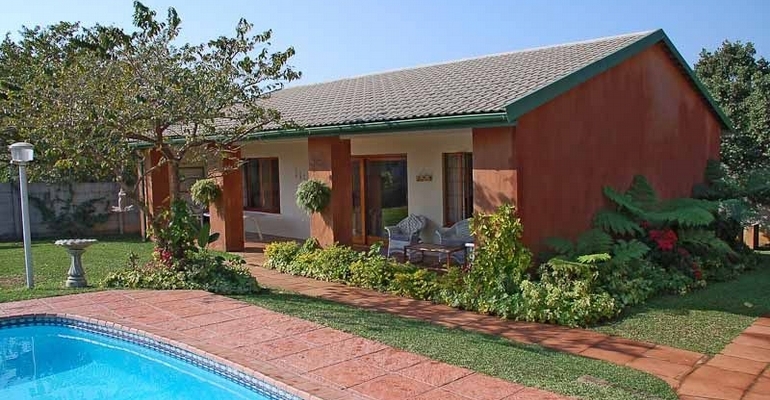 Each unit has a braai next to it and a sparkling pool between the cottages. The property is fenced with safe parking. No pets allowed. Please note should the number of guests exceed the maximum they will be charged R500 per head extra. The main bedroom has a queen size bed with a bathroom en-suite, the second bedroom has two single beds, and the 3rd bedroom has a queen sized bed. Separate bathroom. In the lounge we have a sleeper couch that can sleep two. The main bedroom has a queen sized bed with a bathroom en-suite, the second bedroom has two single beds with a separate bathroom. In the lounge we have a sleeper couch that can sleep two. The main bedroom has a queen sized bed + 1 single bed and a bathroom en suite. The second bedroom has a queen sized bed + 1 single bed with a separate bathroom. We have a sleeper couch in the lounge that can sleep two.